Things have been quite busy here in Texas. It’s our crazy time of year at work which usually leaves us literally running out the door around 6am while shooting back a shot of espresso just to make it through the day. 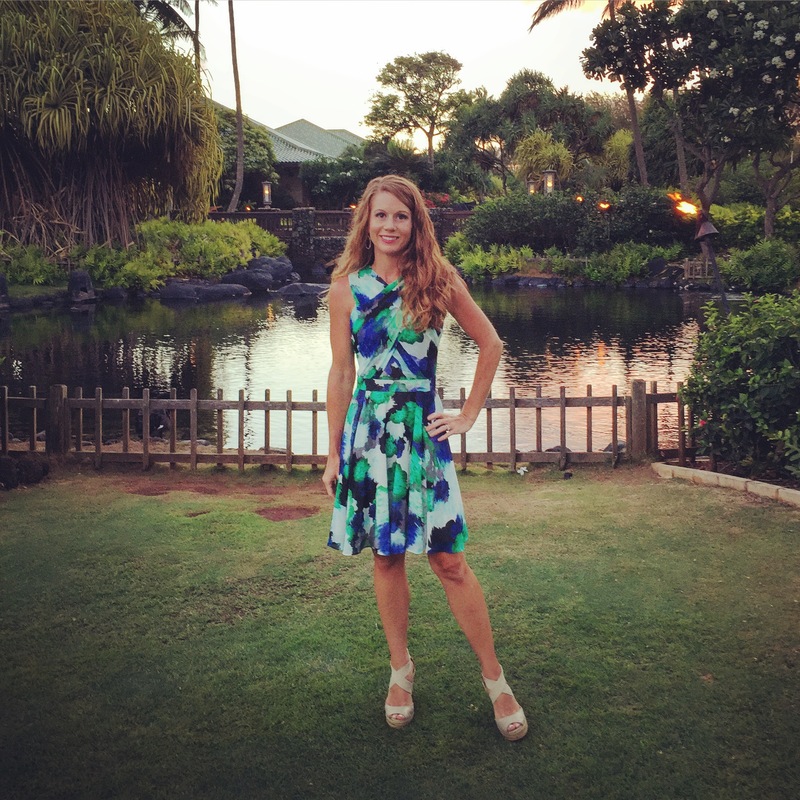 For those of you who don’t know about my life outside of Meals With Mel, my husband and I run our own school fundraising business called Big Kahuna Fundraising. Um Yes…. We are the people who go to your kid’s school and tell them about all the awesome prizes they can win by selling things like cookie dough, gift wrap, and kitchen items to help raise money for their school. Over the past month and a half now we’ve been in prime kickoff season doing school fundraiser assemblies all across North Texas. Now as the season has transitioned from summer to autumn my job has now transitioned from fundraiser kickoffs to fundraiser deliveries (meaning I go to the schools and stay all day making sure all the fundraiser orders get picked up). During delivery season there isn’t much time to eat and no such thing as a “lunch hour” we are constantly on the move. While we don’t always have time to eat I do try to keep things like my Blueberry Nut Crunch Granola, Green Apples, or Peanuts and Candy Corn on hand for that little boost to help make it through the day. Recently, after an early morning kickoff I was munching on some of my Blueberry Nut Crunch Granola and finding myself in need of serious caffeine boost. That’s when I had an epiphany. 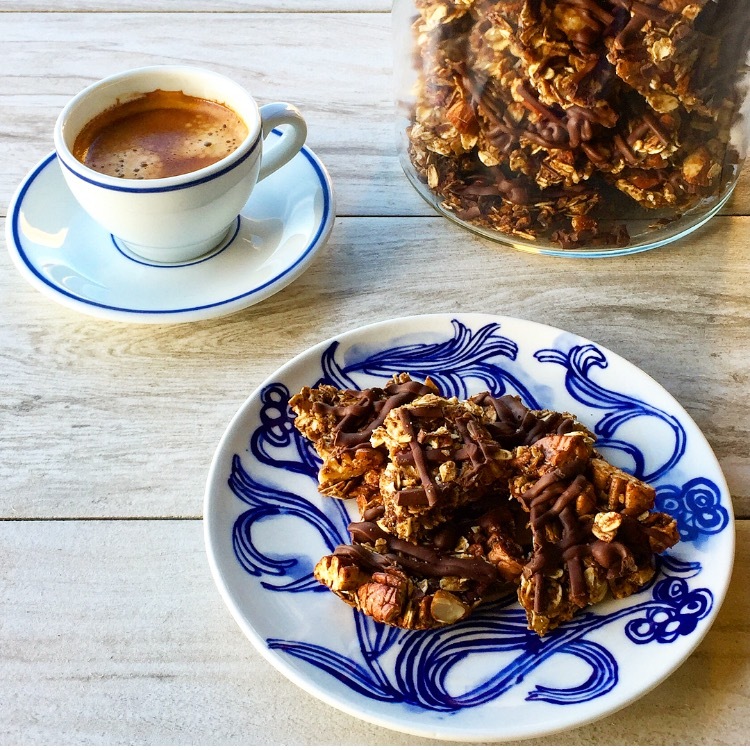 I need to make a coffee flavored granola and since nothing goes with coffee better than chocolate lets drizzle that coffee granola with a DARK CHOCOLATE. I’ll call it Café Mocha Granola. In a small bowl add the honey, coconut oil, cinnamon, and instant espresso powder. Stir to combine then heat in the microwave for 45 seconds. Add the vanilla and set aside. In a large bowl add the oats, flaxseed meal, pecans, salt, 1/2 cup of almonds roughly chopped, and brown sugar. Pulse the other 1/2 cup of almonds in a food processor until finely chopped then add to the oats. Stir to combine. 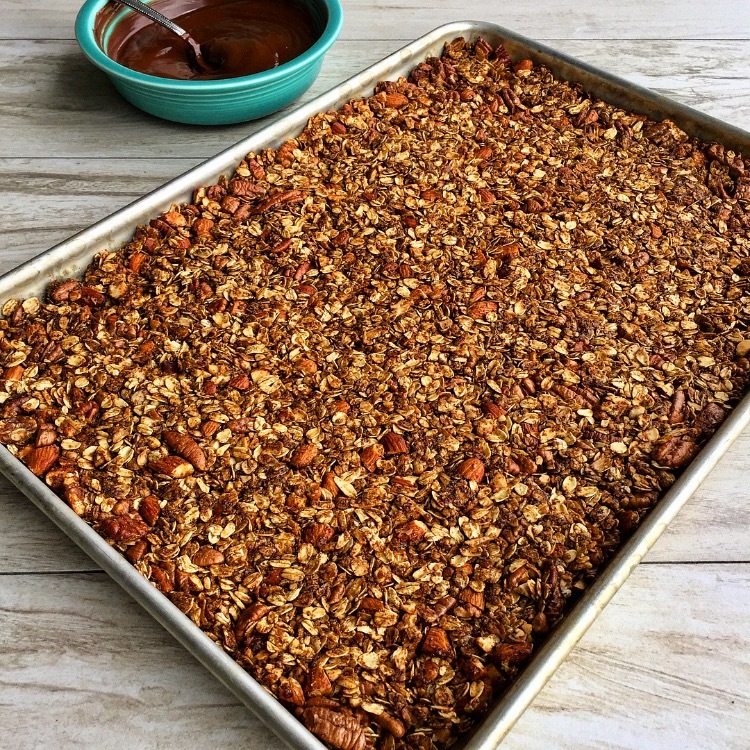 Bake the granola for 10 minutes at 350 degrees. After 10 minutes quickly remove the granola from the oven and toss. Then carefully pack the granola back into 1 even layer and bake for 12-15 minutes until golden brown. Once the granola had cooled completely (after about 1 hour) drizzle the top with melted dark chocolate and then allow the chocolate to harden. Break the granola into chunks and store in an air tight container. Just pinned this! We eat so much granola at home and this mocha dark choco one sounds amaaaazing. Hooray!! you’re back! Hope you’re over the beginning of the year hump for work! And I’m with Jasmine. I’m pinning this! 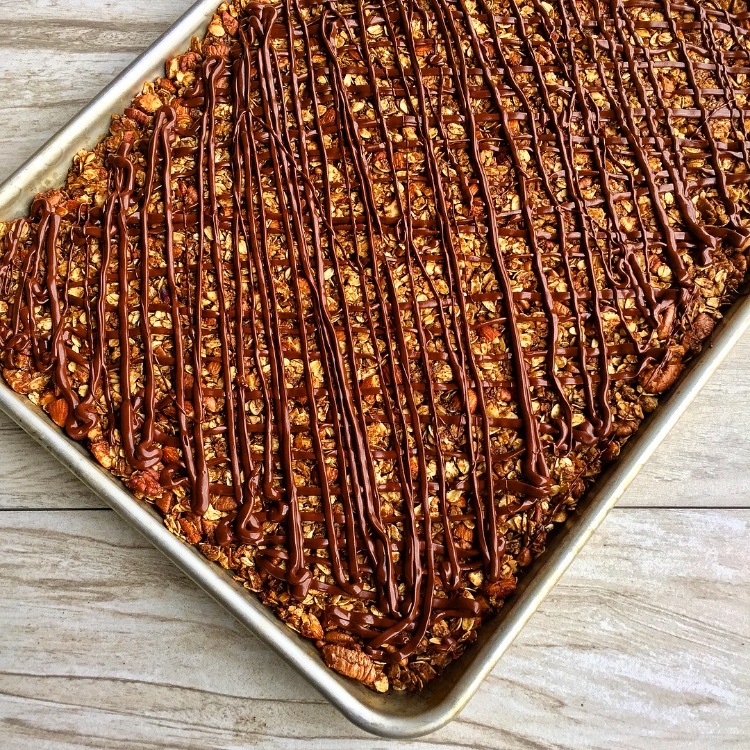 It has all my favorite ingredients– oats, mocha, chocolate, almonds… It looks like the perfect snack Melody! So fun to have you back at it… hugs hugs. I’m glad you liked the granola recipe it’s becoming one of my favorites. Although I will admit I’m not always the best at measuring out the Almonds and Pecans… a few extra nuts never hurt anyone right? Yeah things have still been crazy but that’s just life right? Lately I feel like I’ve been in a food rut I’m cooking all the time just nothing new…. it’s like a creative cooking block. Maybe all I needed was a little extra caffeine 🙂 Hope all is well in California!! This looks amazing!! Thanks for sharing your epiphany! Melody–Just dropping in to see if you’ve had a chance to post– and to say Hi friend! Hope you have a wonderful weekend in the offing… missing all your good Texas food! hugs hugs! Things have been good here in Texas just crazy busy but with the start of November things will FINALLY start to slow down and get easier. Now if the weather would just cool down too. I’ve been trying to get in the kitchen a little more and I’ve got a few fall recipes on the way. It will be good to get back into blogging I’ve missed it and all my blogging friends. How are things is California? I see you have a precious new grand baby 🙂 Congratulations by the way!! Wow Melody– sounds like it’s been a crazy several weeks. Fun to see you at the Cowboys game!! (thanks Facebook) We’ve missed you too. Glad you’re jumping back into your blog, love your fresh Texas recipes1 — and we are doing well here. Just home late last night from almost 3 weeks in San Francisco to welcome the new grand-girl. It was the sweetest time. I’m off to check you blog right now! Hugs friend!